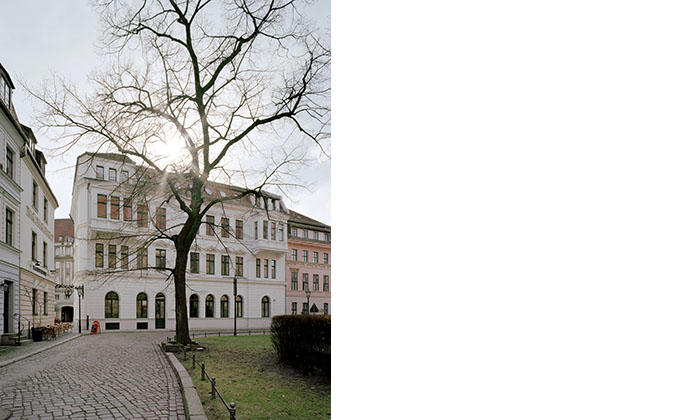 The Schuberthaus on the Poststraße 21-22 in Nikolaiviertel in Berlin-Mitte was restored in close cooperation with the Berlin Heritage Office. The three-storey corner building of late classicism with an extended attic was erected in 1870 as an office building for the C. A. Schubert company and rebuilt again in 1956-1957 after its destruction during the Second World War. The Facade on the Poststraße is structured on the ground floor by round half-pillars, over which a robust cornice is projected. During the times of the GDR the main Office of water ways was situated here, afterwards the Office of waters and ships of Berlin. As a part of a building ensemble of Nikolaiviertel it stays under the protection of the preservation order. The building was modernized and core redeveloped in close cooperation with the Heritage Office. The small-scale single bureau floor plan is annulled in favor of the original greater space units. The rooms of ground floor up to the rooms of the second floor are designed as the spaces for art exhibitions. On the third floor there are three appartments partly with a roof terrace.